The Cubans were here! - The tour in words, pictures and videos! : Just 30 Days to go! The Cubans were here! - The tour in words, pictures and videos! The speaking tour is now over! It has been an intense 2 weeks, for everyone involved! Thank you to everyone who took part! And thank you to the 2665 people that attended the events! Onwards! Just 30 Days to go! Yes! We're almost there! You still have time to get involved and help us to organise. 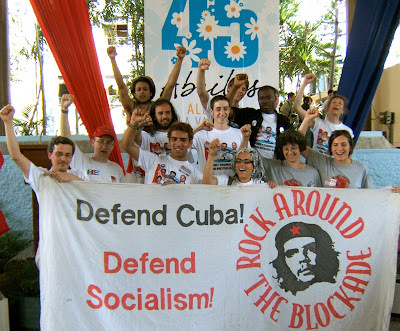 We need to make this a huge event, how else can you meet Cuban Revolutionaries?! This isn't going to be an event of autograph signing or the such! Trust! The Cubans are coming to show us how they have taken a grasp of their own lives and are shaping it directly, as a whole. You've got to ask the question, 'How have the Cubans managed to survive this long with so much aggression from the U.S?' and with revolutionary movements being crushed all over the world, in the past, and as we stand, now, how come Cuba has survived? And how has Venezuela learned from this process?! Bolivia?! once at the mercy of imperialism, how are they being reborn now?! Let's take inspiration, we're more than capable of fixing this mess! When the tour actually starts, on 21st Feb, we will be constantly updating this page, with the days events. Stay tuned! - and book mark this page and the main site too! Bob Crow speech from our opening rally! Cubans come to Durham, Speaking Tour! Cubans come to Liverpool – Speaking Tour Video Two! Cubans come to London – Speaking Tour Video One!